This piece is part of a triptych created for the I-8-tee show, Connected with MOJA in Charleston SC. 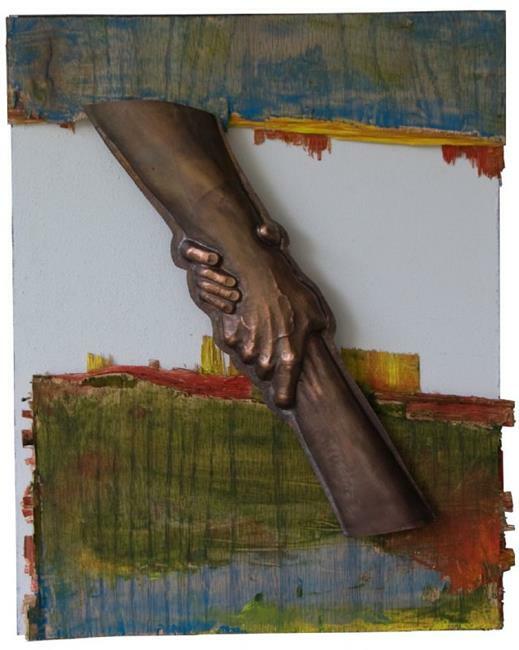 Artist’s Statement My work is about the Earthquake in Haiti and the response to those in need. Mankind is a social being. It is the essence that defines us. I reduced this interaction to a series of images of hands because hands are the agents of our actions. We offer help when needed. The rescuers were a mix of locals and people from all over the world as were the people pulled from the ruble. In that kind of situation, nationalities and cultural differences fall away and we respond to the better angels of our common nature. The third image is the most important. The survior is actively participating in the rescue. We must want to live, we must work for our deliverance, even if that means just staying alive long enough. Holding on comes in many forms. The Process of Repousse I work in a technique called repousse. Repousse starts with a thin sheet of metal. Various tools such as punches, hammers and stakes are used to stretch and manipulate the metal into a three dimensional form. The work flow is similar to drawing in so far as the evolution of the image moves from general shape through increasing levels of applied detail. The metal is worked cold but must be heated in between stages to relieve the stresses of work hardening. Care must be taken not to thin the metal to the point of failure where the tool breaks through. When finished, the work has a high quality surface with no porosity. It is much lighter than the equivalent image would be using a process such as casting. Repousse has a long and rich history in many cultures and has been used for thousands of years to create many unique works. It scales well, useful for anything from jewelry to the Statue of Liberty. Unfortunately repousse has fallen out of favor in a mass production society because the process does not use molds or dies to produce the image. Each item is worked directly in the material. Ironically, this is also a strength for those seeking an exclusive and singular piece in the same way that a fine oil painting is.